Just a short & sweet post today. 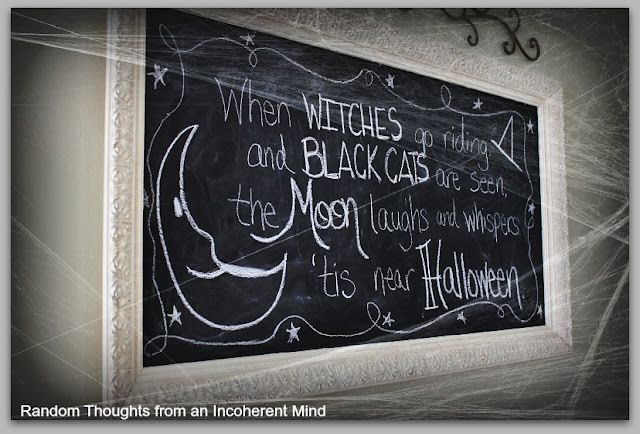 and the Halloween sentiment that I added to it. I am having alot of fun with this blackboard. Love it Gina. Beats Welcome that I have on mine now. Very cute Gina! I can't wait for Halloween. You need to put wanting a Chalkboard Pen on your gift wish list- you have a wonderful blackboard! It's very spooky and scary! So cute. I love the poem. They have chalkboard pens? I need to get in gear...I am behind with Halloween decor. When the nest was full, I had the place decked out on October 1st. You have inspired me. That is so cute, Gina! Chalkboards are so much fun! That is cute and love your little saying. Speaking of witches, have you seen the Geico commercial where the witch is riding all the brooms in the broom factory? It's a hoot! Such a great saying. So simple and what a great post. Thanks much. I need to write that down. Gonna make a sign out of it. I really need to make a blackboard. Looks like a lot of fun. Have to go out to shed, see what kind and size of frames I've got out there. Thanks for wonderful inspiration. SEE! It looks great. Def grinding mine down. LOL. Very cute Gina and a wonderful sentiment. Wow, you could get carried away with it. Yipeee...Mike just told me last night he has to work that night. WHAT?? It sure will not be the same without him. No party though this year. Love your chalkboard. I pinned it to remind me next year I want a chalkboard for Halloween words. Maybe I could still do it this year? ADORABLE and spooky at the same time. You addition of the cobwebs really makes the whole vignette! I just followed you... thought I had a while ago... but now I am!!! I ❤it. I can't believe how fast Halloween is approaching! Way too fast. Before we know it Christmas will be here too. Fun! Being empty nesters this year I miss these little fun additions to the house.